Facilitate a Morag Tong contract on Brotherhood turf. The assassin Naryu Virian must kill a Dark Elf noble in Kvatch to fulfill a contract for her shadowy organization. However, she doesn't want to attract the attention of the Dark Brotherhood as she completes her work, so she asked for my help. "Wake, wake, my darling. You can sleep when you're dead—which will be sooner than you think." Find Naryu Virian near Castle Kvatch and talk to her. 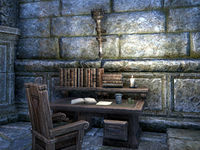 Enter Castle Kvatch and find your way to the Dark Elf noble's room. Open the secret passage and allow Naryu to complete her contract. Exit the castle, making sure somebody notices you on your way out. Meet Naryu at the inn and talk to her. I agreed to help Naryu complete her contract and then take credit for the crime. I should ask her to tell me more about her target and find out if she has a plan for sneaking into Castle Kvatch. I need to reach the room where Dathus Ildrim is hiding and open a secret passage. This will allow Naryu to covertly enter the castle, dispatch her target, and leave without being spotted. Dathus is fast asleep. I need to open the secret passage so Naryu can enter his room and dispatch him. Naryu has arrived to dispatch Dathus Ildrim. I should stand back and let her complete her contract without interference. Naryu allowed Dathus to call for the Castle Kvatch sentinels before she killed him. To fulfill my part of the bargain, I need to leave by the main entrance and make sure someone spots me so I can take credit for assassinating Dathus. I made sure I was seen leaving Castle Kvatch so that I'm sure to be blamed for the assassination of the Dark Elf noble. I should meet Naryu at the inn and wrap up our business arrangement. Finishes quest Naryu confirmed that no one spotted her leaving the castle. Her secret is safe, thanks to my help. I should find out what she plans to do next.